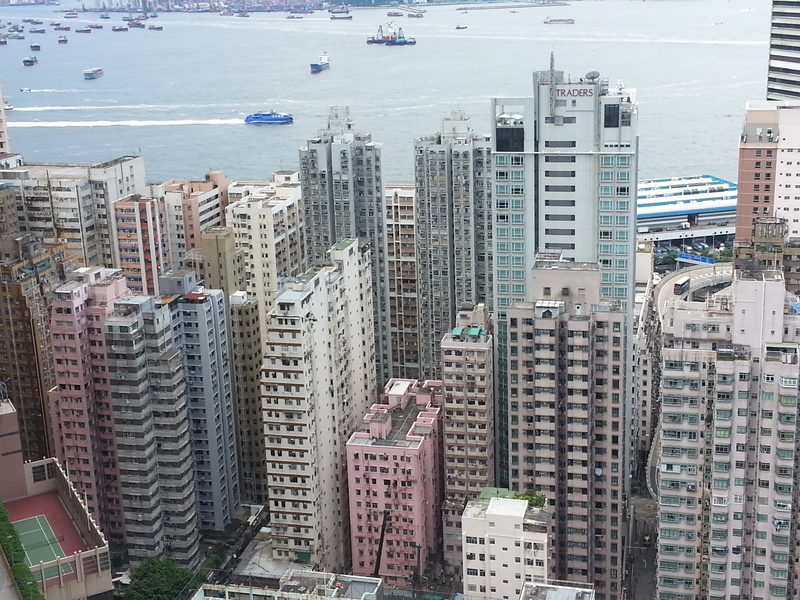 Sundays are always so busy in Hong Kong! Last Sunday had an interesting intersection of the migrant workers’ organizations and the prodemocracy movement. 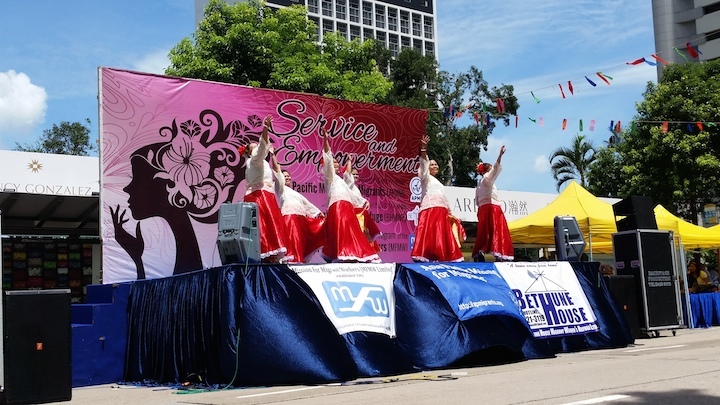 In the morning through afternoon, the Asian Pacific Mission for Migrants, and the Bethune House Migrant Women’s Refuge celebrated their 30th and 28th anniversaries with a stage, performances, and free services on Chater Road in Central. This area, near Statue Square, is already widely known for being a favorite hangout spot for foreign domestic workers, so having the celebration there was like bringing the party to the heart of the community. 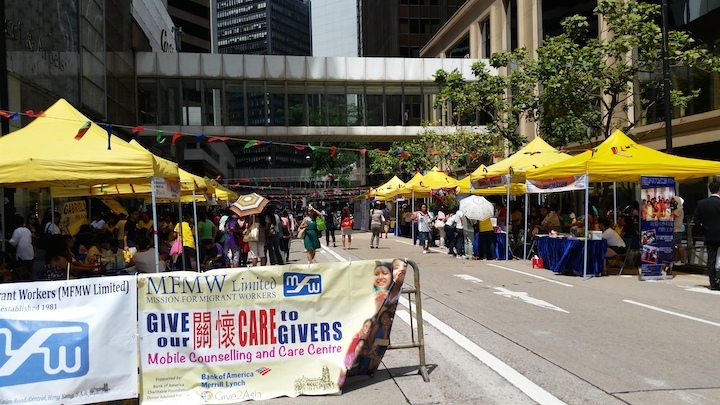 Recognizing that many domestic workers are hired to look after young children and the elderly, the Mission for Migrant Workers, the longest-established organization for migrant workers’ rights in Asia, held a “Give Care (關懷) to our Caregivers” event alongside the anniversary celebrations. They brought together free massages, counseling, and other services. 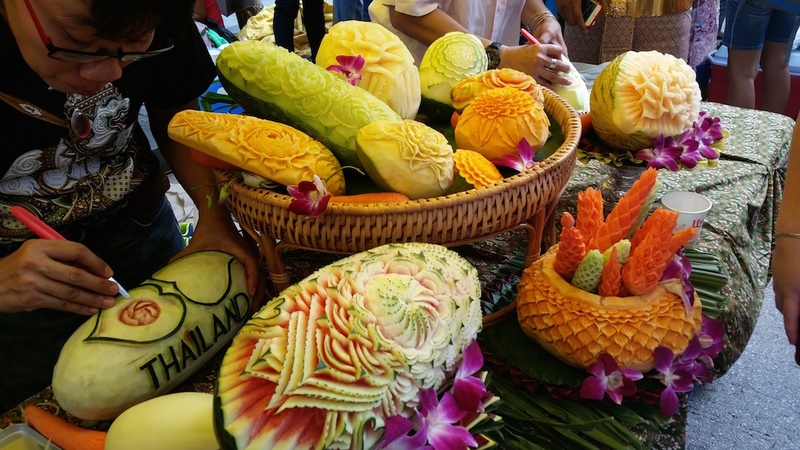 The Thai women’s organizations brought their signature offering: beautiful carved fruit! Early in the program they held a Mass, which I missed. Even though about half of the foreign domestic worker population in Hong Kong is now Indonesian, a predominantly Muslim country, the program had a stronger Filipino influence – mostly because the organizations being celebrated were founded by Filipinos in the 1980s. Throughout the day, most of the performances were modern dance groups dancing to popular music. Some of the performances throughout the day showcased traditional Filipino, Indonesian, and Thai cultural dances; only a few were overtly political in tone, but for the most part they celebrated the diversity of the different FDW communities. I was really surprised to see how strong the Spanish influence was on Filipino dance – many of the songs and costumes reminded me of Mexican folklórico performances, another former Spanish colony. The program went on throughout the day until about 5pm, which is when their license to be in the area was up. At 3:30pm, Occupy Central supporters began their 黑布行 (Black Cloth March) from Causeway Bay to Central – and where in Central would they finish, you may ask? In the exact same spot as the APMM and Bethune House’s anniversary celebrations. In a crazy way, there were two groups trying to occupy Central at the same time. Throughout the day, the crowd at Statue Square was largely made of up migrant workers and their friends, but gradually a significant crowd of ethnic Chinese began to appear. As APMM and Bethune House began to take down their stage, Occupy Central supporters began to put up theirs just a few hundred feet to the side. 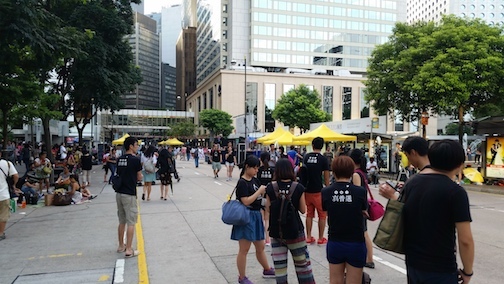 In one scene: MFMW’s yellow booths and pennants in the back, as well as a group of women migrant workers seated on the ground on the left; and prodemocracy youth wearing shirts reading “真普選” (true universal suffrage) waiting for the marchers to arrive. I didn’t get many great photos of the march or the cloths, but you can easily find those online. The booths and stage set up for the MFMW and anniversary events were just packed up when the prodemocracy march turned onto the street. Numerous groups of migrant workers were still sitting on the fountains and benches in Statue Square, but the area closest to Chater Road was now filled up with ethnic Chinese and a handful of expats. 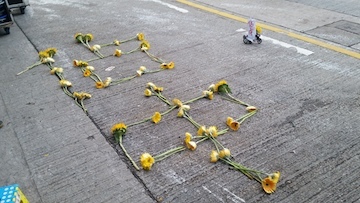 * I sat with the Chinese supporters along the edge of Statue Square, and as we waited for the march a group of men to my left spotted radical politician Leung Kwok-hung, whom they called by his nickname, 長毛 (Long Hair) – despite his hair having been cut by Hong Kong police during his last detainment in June – and as he came by to shake their hands, the men told him, “加油!” (Keep fighting!). The leaders emphasized that their march was in support of the student strike (罷課), which will last for a week, beginning Sept 22, for university students and for one day, Sept 26, for secondary school students. I talked to a few of the migrant workers still in the area afterward about their thoughts on the Occupy event that had just happened while they were hanging out with their friends in the Square. Most didn’t have any interest in Hong Kong politics, which makes sense, though some had heard of Occupy Central but didn’t know much more than the name. More on the student strike in the next post. *Expats is also becoming a really problematic word for me, since you could easily be Chinese America or Canadian American and consider yourself an expat in Hong Kong – despite not looking like one. So when I use the term, I typically mean people who look “white.” As another example of how confusing these categories are, one sign that got a lot of media time (scroll to the last photo of the SCMP article) was held by a white man wearing a shirt with the anarchy symbol on the front and the words “One for all and all for one” spray-painted on the back. His sign read, “今天不站出來，明天站不出來” (If you don’t come out today, tomorrow you won’t be able to), and his young daughter’s read, “我反抗，故我在” (I rebel, therefore I exist**). The man’s wife (ostensibly) was an ethnic Chinese woman. Dans l’épreuve quotidienne qui est la nôtre, la révolte joue le même rôle que le “cogito” dans l’ordre de la pensée: elle est la première évidence. Mais cette évidence tire l’individu de sa solitude. Elle est un lieu commun qui fonde sur tous les hommes la première valeur. Je me révolte, donc nous sommes.